You can customize your Character Lists on the EQ2U Homepage! Head to My Settings and you can change the Colors and Stats displayed about characters and character groups. EQ2Wire is proud to offer a website built on the EQ2 Data Feeds API. As a guest, you get all the functionality of the original EQ2Players site such as searching for Characters, Guilds, Items, and Spells in EverQuest II. Please take a few moments to Register an account with EQ2U. It's fast, free, and painless and you'll gain access to a growing pool of features to improve your characters and gameplay. With an account, you'll be able to remember your characters and those of your Friends and Guildmates, then build Item Wishlists and save Beetny.com AA specs right on your character. We are working diligently to add additional features like Quests, NPCs, Loot, and add more guided information to the site. PLEASE read the Help & FAQs page as it contains answers to a lot of questions you may have. Your donations make it possible for us to continue to operate and update EQ2U! Lore & Legend, Factions, Recipes, Collections, Collection Rewards, Ascension, and Guild Achievements have been updated for Chaos Descending. Quest data excluding Chaos Descending has now been imported. We hadn't updated in a while. We are working on getting Chaos Descending data even if it requires some manual data entry. Collections can now be linked directly by name (added for DarqUI). Fixed a problem where collection reward popups wouldn't load. Guild Search excludes inactive servers by default. Character Spells page now detects and displays whether your character has scribed Epic 2.0 spells and their current tier. Level 101-110 Spell data has now been loaded. Level 101-110 spells that replace lower-level spells should all be set correctly. Character Spells page now checks your completed Quest journal to determine if you have Epic Repercussions completed. Ascension level 11-15 spell data has been loaded. Achievements which have been removed from the game can now be excluded from EQ2U. So far, 9 achievements have been blocked. Please e-mail us if you find more! Excluded several Quests which were removed from the game. Loot Data from Dragon's Armory has been updated to default to level 110 zones/npcs. Ascension tab for characters now handles Ascension levels 11-15. There is a Census bug with boosted Ascension which prevents displaying the Progress bar. We have not yet loaded level 11-15 Ascension spells. Gear Report can now be used for either Resolve (for modern servers) or Stamina (for TLE servers). Fixed some bugs with excluding Guild ranks. Items now display "power" instead of mana. Resists display "vs type". Updated Achievement category tabs and subcategories. Updated Collections and Collection Items/Rewards. Verified there are no new Languages or Lore & Legend this expansion. 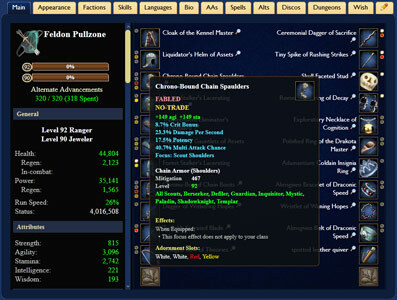 Added Resolve as a Character Group setting for the EQ2U home page. Increased level cap to 110. Increased guild level cap to 250. Leaderboards have been updated after a long hiatus, but aren't updating automatically yet. Race to Trakanon data was restored from a backup. Gear Report level cap raised to 90 for Stormhold. Orange adornments now show on the Character sheet. Character health is no longer capped at 16.7 million. A new Ascend tab has been added to characters to view Ascension Levels & Spells! Character Tabs have been rearranged to better suit a "Choices" vs "Achievements/Appearance" grouping. Hopefully the change is not too jarring! Autoattack stats have received new tooltips and styling on the Character Details sheet for level 100 characters to reflect the importance of Autoattack with recent content updates. Introducing Item Compare! When viewing any piece of armor, jewelry, weapon, or shield, click on the scales icon in the Wishlist box to compare that item to existing items on your chosen character. Must be logged in! AA Spell data has been updated for Kunark Ascending, including changes to Prestige Conversion, etc.. Characters who have chosen more than one Heroic Endline in their Alternate Advancements will now see the correct points calculated on the Tooltip and Total Points spent. Recipe data has been updated to include ~900 new recipes from Kunark Ascending, Nights of the Dead 2016, Frostfell 2016, etc. Nuked a longstanding caching issue where Recipe data for characters NEVER updated. NOTE: We are working on adding Ascension and Mercenaries character tabs. NOTE: We've reported the issue with Ethereal Off-hand Weapons with 'Overcap Crit Bonus' stat not exporting to Census. Loot Tracker now defaults to showing level 100 items. Zone List can now be filtered to Solo, Heroic or Raid. Gear Report has been optimized to only load characters that match specified filters. Ability Mod stat was added, and the red/yellow/green color thresholds have been adjusted to reflect current Resolve, Health, Crit Bonus, and Potency values. Added 'Select All' to Character Spells page. Collections updated for Kunark Ascending. Thanks to player feedback, 9 invalid collections were removed. Character Recipes wasn't updating properly! We cleared the ancient data cache until the issue could be fixed. Gear Report has been revised to show Resolve instead of Stamina. Items now display Resolve stat and GREATER RELIC flag if they qualify. Added Resolve stat to Item Search. Gear Report now only returns characters from active servers. Characters updated to support Resolve. Increased Fervor hard cap to 200 on Characters. Server dropdown menus on Character and Guild search now show active servers first. We've removed the buttons for inactive servers from the Leaderboards page. Fixed an issue where Character Discoveries was showing more than one discovery date. Damaged Spirit Stones now display a notice that they can be crafted into functional ones. All ToT dropped items now display which Infusing materials they can be Salvaged into. Improved Item Search with multi-select Item Flags and Effect Name choices. Added Weapon Damage Bonus and Fervor to Character Details. Reloaded Quest data for the expansion. Updated Recipes and Collections for the expansion. Equipped items now show Infusing data. The Terrors of Thalumbra Tradeskill line has been added to Tradeskill Report. Guild Search now supports level 101-150 guilds. Item Search now supports RELIC, PRESTIGE, LORE-EQUIP, etc. Added The Hand of the Maker tradeskill quest line to the Tradeskill Report. We have preserved the Item Discovery data for the retired servers of Butcherblock, Crushbone, Everfrost, Freeport, Guk, Permafrost, Oasis, Nagafen, and Unrest. We have added RELIC and PRESTIGE flags to items. Personal and Guild Achievements for Terrors of Thalumbra have been added. Added Cepholex, Fathomlurker, and Poxfiend Lore & Legend quests to L&L character tab. Tradeskill Report - We're thrilled to introduce the Tradeskill Report to EQ2U. This feature allows you to see the progress of any number of characters on all of EQ2's main tradeskill quest lines. Nearly 300 quests are tracked in this checklist. Our master Quest List and Recipe Book list can now be accessed directly from the Quick Search box on the EQ2U front page. You no longer need to navigate to a character first. Character searches should no longer timeout because a Server (world) filter has been chosen. When displaying the Minimum and Maximum damage on a Weapon, we now show the base amounts in Item Popups and the Item Details page. Fixed an issue where weapon damage displayed on the stats column of the Character Details page maxed out at 32,767 (2^15-1). PvP Leaderboards -- We've added Leaderboards for PvP City Kills, Wild Kills, and Deaths. We'll add PvP Kills vs Deaths Ratio and PvP Total Kills next week. We've got loot! -- Browse the Zone & NPC Loot Database to see where items drop! When viewing the details for an item, you'll see where it drops. EQ2U receives this data from players who've installed the Dragon's Armory Tracker plugin. Tooltips -- The stats in the left column of Character Details pages now all have helpful (We hope!) tooltips. Character Tabs have been adjusted to make room for a new tab -- Dethdlr's Adornment Calculator. Collectibles! -- You may now browse all the Collectibles in Norrath, as well as view the rewards they offer. When viewing a Collectible item, it now links back to its collection. Collection and Quest Reward Items -- Items which are a reward from a Quest or a completed Collection now link back to the Quest or Collection that awards them. Added Refining, Experimenting, Transmuting, Accuracy, AE Autoattack, All Attributes, Arcane, Chance to Block, Elemental, Flying/Leaping/Gliding Speed, Flurry, Mitigation, Noxious, Strikethrough, Threat, Unconscious Health as searchable effects in Item Searches. Contact Form -- In order to facilitate feedback, bug reports, and easier contact with our users, we've added a Contact Form accessible anywhere on EQ2U. Fixed an issue preventing searching for Food and Drink of a specific level. Item searches now hide more irrelvant fields based on item type. When using the Spell/Combat Art Browser (rather than viewing the Spells/CAs for a specific character), you'll now see Grandmaster and Ancient spell information, as well as buttons to view Expert and Grandmaster recipes. We now support Equipment and Appearance Gear Sets. Look for the new buttons at the top of Character Details pages. Gear Report has been revamped for Altar of Malice. In place of the now-unnecessary adornment slot pips, Armor slots now show gem slots (ie 4/4 Altar of Malice green gems). Columns have been added with Arcane, Noxious, Elemental, and Physical (Mitigation) Resists. Stamina and Health baselines have been increased. Our Dungeon Maker pages now reflect a recent change where all EQ2 characters are automatically granted nearly all DM items and spawners. Weapons which apply a specific damage type (Fire, Mental, Divine, etc.) now show it. Weapons now also show the correct raw minimum damage. EQ2U uses realtime character, guild, and item data provided to us by Daybreak Games. If you wish to Opt-out Characters and/or Alts, please read our Frequently Asked Questions page. If you have any further questions about Privacy, please contact Daybreak.